The Lebanese American Council for Democracy (LACD) is powered by those in the Lebanese-American community who are dedicated to restoring Lebanon’s democracy, stability, integrity, and sovereignty. We strive to build awareness of Lebanon within the American government, media, and culture. The LACD is dedicated to providing policy makers, diplomats, and journalists with facts, scholarly research, and commentaries on issues relating to Lebanon and the Middle East. Fundamental to the LACD’s activity is the indisputable notion that the Lebanese and American people share the same patriotic values; namely, cherishment of democracy, liberty, tolerance, coexistence, peace, and human rights, and therefore, the Lebanese and American people are natural partners. The LACD strives to impact formulation and implementation of U.S. foreign policy in the Middle East, on the basis of safeguarding Lebanon as a strategic ally. The LACD believes that Lebanon is a vital element in overcoming terrorism and democratizing the Middle East, and that the U.S. should highlight Lebanon’s role in the Middle East as a paradigm for a free, progressive, and stable Middle Eastern democracy. In this way, the LACD seeks to, positively influence relations between Lebanon and the United States, solidify the bond between their respective peoples, and strengthen the long-term security of both countries. The mission of the Lebanese American Council for Democracy (LACD) is to collaborate with the United States in order to bring greater stability and security to Lebanon, the Middle East, and America by promoting and enforcing the principles of liberal democracy, free markets, peace, and the rule of law, as well as the unconditional respect for human rights. Gabriel Issa’s patriotic journey started shortly after he arrived to the USA in 1976. After earning a civil engineering degree from the Detroit Institute of Technology, he started spending his personal time advocating and promoting peace and unity for his native Lebanon. Through leading by example, he reinforced his belief in attaining peace by organizing marches in support for the stability and unity of Lebanon, and lobbying for the formulation of foreign policies that support and enhance freedom and democracy and eradicate prejudice and conflict. Issa joined efforts with co-founder, Tony Haddad, to form the LACD core lobbying group in 1990 and coin the concept of "making the cost of occupying Lebanon outweigh its benefits". Their first lobbying achievement was in passing in 1993, the non-binding Sense of Congress Resolution 28, which opened the floodgate for several other resolutions in subsequent years in support of a free Lebanon and served as precursor to eventually passing a binding Bill, The Syria Accountability and Lebanese Sovereignty Restoration Act of 2003, that transformed the U.S. policy toward Lebanon and led to the withdrawal of occupying Syrian troops. In 2005, Issa also acted as President Michel Aoun's special envoy to Syria to negotiate a peaceful Syrian troops withdrawal. In July of 2017, Gabriel Issa was appointed Ambassador Extraordinary and Plenipotentiary of Lebanon to the United States of America. He took office upon presenting his Letter of Credence to President Trump, on January 24, 2018. He has since resigned from the LACD Board of Governors and moved to Washington, D.C.
Tony Haddad moved to the US from Lebanon in 1981 and soon after, became a dynamic Lebanese-American activist. Ever since, he devoted most of his personal time and resources in a tireless pursuit of a free, sovereign, and peaceful Lebanon. He took a leading role in rallying and empowering Lebanese-Americans to utilize their resources and help their war-stricken homeland. The most noteworthy accomplishment that Haddad has made was his contribution in drafting, introducing, and advocating The Syria Accountability and Lebanese Sovereignty Restoration Act of 2003, which was signed into law in December 2003. Mr. Haddad lives in Maryland, is the president of the Haddad Development Group and owns businesses in the metropolitan DC area. Upon graduating from the Université du Saint Esprit-Kaslik, Lebanon, with a degree in Finance in 1984, Elie Azar moved to the United States of America where he pursued his Master’s Degree in Business Administration at the San Diego State University. In 1988, he moved to New York and started working as a trader at UBS, then at Bank of America Capital Markets as Vice-President, and later as the Managing Director of Foreign Exchange Options at BMO Capital Markets, specializing in Derivatives Trading. His successful journey in the US did not assuage his love for war-stricken Lebanon. 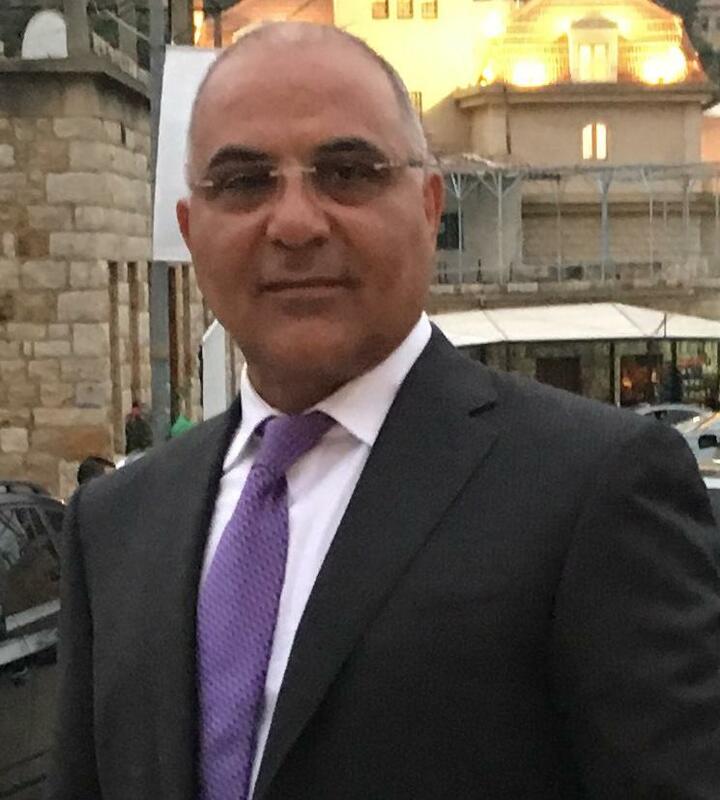 Through consistent efforts to advocate for equality and peace in his native country, Azar remained connected to the unique culture and traditions of Lebanon. His involvement with the Lebanese American Council for Democracy is exemplified by his distinguished commitment as the President of its New Jersey-New York Chapter and commendable efforts at the national level. Since his retirement in 2015 and influenced by the progressive and broadminded views of Lebanese President General Michel Aoun, he re-focused his work with the organization to find new ways to support Lebanon’s independence and economic stability, as well as promote strong bilateral relations between Lebanon and the U.S. He was elected President of the LACD in September of 2018. He currently resides in Stirling, New Jersey, with his lovely wife Eliana Nammoura and three daughters, Daniella, Nicole, and Cerine.